When the time came to buy a router table I figured a shaper would be a better choice. It cost only a little more than a quality router table, but was a stand alone machine. The motor of the grizzly I settled on was much more powerful than my router's, plus I did not have to buy all the cutters twice. I was sold on the idea and bought the G1035 shaper from Grizzly. The G1035 is clearly a machine for hobbyist; granted, serious hobbyists, but hobbyists none the less. Several points in this review will illustrate this. The machine is very top heavy. The sides of the machine are thick gauge sheet metal on three sides. there is no bottom and the backside is partially open. The motor is mounted toward the top of the machine. The bulk of the weight is in the cast iron top and the fence assembly. Once person can easily move the shaper. The top is very small without the extension table. Even with the extension table you only have 20 inches of width to work with. This fact alone for me positions the machine in hobbyist territory. If you buy this machine be prepared to buy the extension table. You will also have to build an infeed and outfeed table, much like the one used for a miter saw. In fact, one very smart shop layout places the shaper inline with the miter saw. That way both tools use the same fence. Without such a table you cannot run long pieces through the shaper. The fence that comes with the tool is capable, but simple. The two sides of the fence move independently. A screw drive move each side in and out. A second screw is used to lock the fence down. This works well enough, but does not inspire thoughts of accuracy. The fence has to be aligned with a straight edge every time. The hold downs provided with the machine are pure junk. There is no way around this. Grizzly should just not ship them at all. The G1035 comes with a few pieces of metal, a few screws, and a metal blade. The blade is supposed to exert downward pressure on the work piece. The awkward fastening method, however, makes this practically impossible. I retrofitted my machine with infeed and outfeed rollers. These work beautifully. I consider these a necessity. Cutter changes are a pain to perform. Two lock nuts need to be threaded on the spindle. This takes time, because the spindle is so long. A second wrench is used to hold the spindle in place when tightening the lock nuts. I wish some company would come up with a design that locks the spindle in place. I hate pushing and pulling in two different directions at the same time. I somehow always end up with scrapped knuckles. That being said, cutter changes are repeatable and reliable. I am just complaining about how long they take. If you use the machine infrequently, you can ignore this comment. Dust collection out of the box is horrible. The back is open, and there is no place to attach a hose. A dust collection hood can be purchased separately. I don't know why you would not want to buy it. Shapers create a lot of saw dust. With the hood dust collection improves, but is not perfect. Some dust still escapes through the open back. I would like to see a closed design here, especially considering that a shaper is not something the occasional woodworker is going to use (read "used once a month"). So how does this machine perform. Setup may be chore, and dust collection is only so-so, but once the machine is set up it performs. Cuts are accurate and repeatable. I have run cabinet stiles and panels through the machine on multiple occasions. Each time I remember being done in no time. The motor itself works beautifully. It powered a full height panel cutter through oak in a single pass without slowing down. Everything adds up to an adequately designed machine. It does what it is supposed to after it is outfitted with several after market parts. This raises the true cost of the machine significantly. Overall the G1035 is a very capable machine for the typical hobbyist. The shaper cutters provide a new unique cutting capability in your shop. 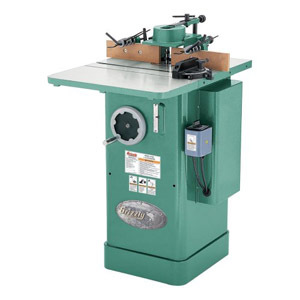 The G1035 will not replace your router table, but it will make you use it much less often. I do not think you can find a shaper at this price point that performs significantly better than the Grizzly G1035. All are going to be in the hobbyist category. That's fine, as long as that's what you are looking for. Sure, I would love to have a bigger table, and better controls. Those are features of full sized shapers, which are out of range for my shop.